• General Dwight Eisenhower’s decoded message to enter the war: PLAY BALL – On November 8, 1942, General Dwight Eisenhower, Supreme Commander, Allied Expeditionary Force, and commander of Operation Torch sent a message to Major General George S. Patton, Commander of the Western Task Force, who was on a command ship off the coast of Casablanca awaiting the coded message to attack. When the decoded message from Eisenhower, “PLAY BALL,” arrived, the American Army entered World War II. • Patton’s invasion map of Casablanca – The map is heavily annotated and marked up by General Patton who commanded the Western Task Force at Casablanca. 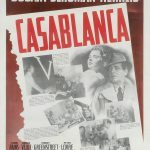 • Casablanca, the movie artifacts – Coincidentally, the movie Casablanca, starring Humphrey Bogart and Ingrid Bergman, came out at the same time as the American invasion. It was instantly popular because the real Casablanca was in the news every day. Movie goers thought they were getting an idea of what was going on. Visitors to the Museum can see posters for the movie, a chair from Rick’s Café, and Bogart’s handwritten chess moves for the movie chess game. It certainly did to the Boston Globe’s Leslie Anderson, who liked the exhibit real well. [Y]es, there are memorabilia from the film starring Humphrey Bogart and Ingrid Bergman. Original movie posters. A chair from Rick’s cafe. Bogie’s hand-written chess moves for the game he plays on screen. Round up the usual suspects! But the “real” artifacts are pretty fascinating, too. Also true: Neither review credits the founder of the museum, Kenneth Rendell, who has collected more than 7500 documents, letters, and artifacts (including six Enigma machines) from World War II. The reviewers give thumbs up to the exhibit but the middle finger to the exhibitor? Not exactly the start of a beautiful friendship, eh? This entry was posted in Uncategorized and tagged Boston Globe, Casablanca, Humphrey Bogart, Ingrid Bergman, International Museum of World War II, Kenneth Rendell, Leslie Anderson, Peter Lorre, The Real and Reel Casablanca, Wall Street Journal. Bookmark the permalink.